diggy. 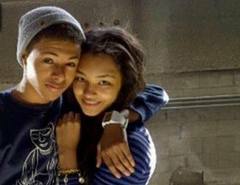 there soooooo cuteeee!!!. Wallpaper and background images in the Diggy Simmons club tagged: sweet. This Diggy Simmons photo contains retrato, headshot, close up, and closeup. There might also be o desgaste de lazer, lazer, desgaste de lazer, outerwear, overclothes, vestuário exterior, roupas normais, rua, cena da cidade, ajuste urbano, cenário urbano, cena de rua, cidade, and urbana definindo. WOW SHE AINT THAT CUTE BUT I WISH THAT WAS ME!